This fabulous ice cream provides an indulgent end to the supper. For maximum flavour, transfer to the fridge from the freezer for about half an hour before serving so it can soften slightly. Finely grate the zest from the clementines, then peel and halve the fruit. Remove any pips and blend the fruit in a food processor or blender until very juicy and any remaining pieces are finely chopped. Mix the vanilla custard in a bowl with the grated zest, icing sugar, 2 tbsp of the brandy and the pulped fruit. In a separate bowl, beat the toffee caramel with the remaining 1 tbsp brandy. To freeze using an ice cream maker, stir the cream into the custard and pour into the machine. Churn until the ice cream has a soft scoop consistency. To freeze by hand, whip the cream until thickened but not holding its shape. Stir the cream into the custard and pour into a freezer container. Freeze for about 3 hours or until almost frozen but soft enough to scoop from the container. Turn into a large bowl and beat with an electric whisk until the consistency is even. 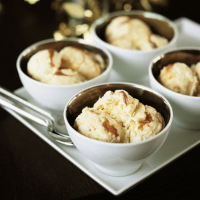 Spoon about a quarter of the ice cream into a chilled freezer container and dot with teaspoonfuls of the caramel. Spoon another layer of ice cream on top and dot with more caramel. Keep layering until both mixtures are used up. Lightly ripple the ice cream by swirling the mixture with a knife until the layers marble together. (Don't overmix or you'll loose the contrast in colour and flavour.) Freeze for several hours. When ready to serve, scoop or spoon into small bowls. Transport the ice cream in its freezer container, packed into a cooler bag to prevent it from melting on the journey. Toast the New Year with a rich, full-flavoured champagne made entirely with Chardonnay grapes.